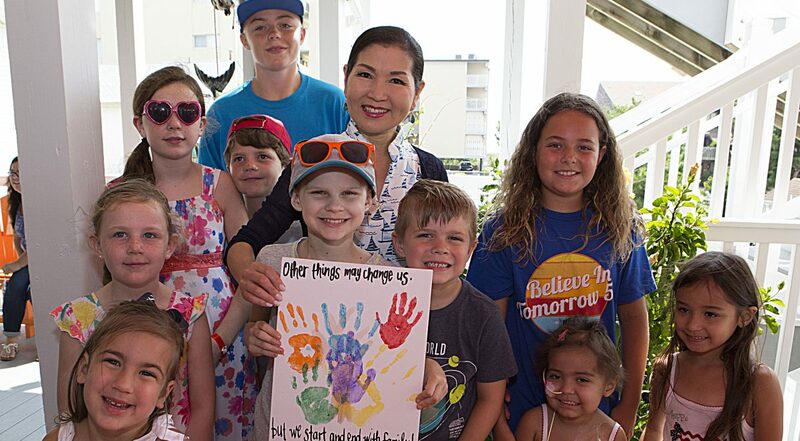 Ocean City, MD — Believe In Tomorrow Children’s Foundation is honored to host Maryland’s First Lady Yumi Hogan again on Friday morning as she participates in an art project with children at The Children’s House by the Sea. Children who stay with Believe In Tomorrow in the Respite Housing program, suffer from life threatening illnesses such as cancer or are organ transplant recipients. The unique Respite Housing program offers children and their families an opportunity to leave the stressful medical world behind for several weeks each year and enjoy the restorative comfort of either a beach or mountains visit. During their weekly stays, children participate in many activities courtesy of local businesses and volunteers. The House by the Sea has been recognized as the first pediatric respite facility for critically ill children in the United States. During her visit to the Children’s House by the Sea, the First Lady will distribute quilt squares that she designed, which will then be incorporated into the memory quilts that are made by a dedicated volunteer. Additionally, The First Lady will participate a special crafting experience with the children. Believe In Tomorrow is expanding its presence in Ocean City, MD in 2018. An additional property is currently under review which will offer at least two additional units for pediatric patients and their families. These additional units will allow the Foundation to accommodate larger families and allow for an increased number of military families who participate through the Foundation’s Military Initiative. About Believe In Tomorrow:Believe In Tomorrow Children’s Foundation provides exceptional hospital and respite housing services to critically ill children and their families. Our unique programs bring comfort, hope and joy to children and their families, enabling them to renew their spirits mentally and physically. Since 1982, Believe In Tomorrow has provided over 800,000 individual overnight accommodations, from every state in the U.S. and more than 82 countries worldwide. Our unique hospital housing and respite housing programs serve as a support system for when families need it most.